Used to think the city bus's oversized semi-horizontal steering wheel looked so cool. Remember how the bus driver had to use his whole upper body strength to turn it. My Grandfather was a bus driver with an 86-mile per day route ; he took me to the bus garage in 1960 and I was amazed at the size of the steering wheel. Of course the bus was as described in the other posts & heading ; large padded seats, rear window, etc... and he policed the bus at the end of the day and cleaned it up. Remember when the bus seats were padded (the actual seat and the back)? Long before they went to fiberglass (so they'd be vandal proof). 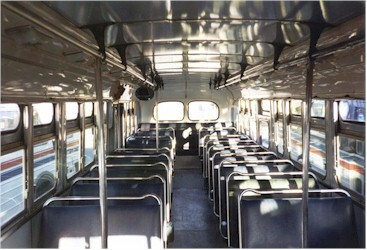 And...the outside of the bus looked almost armored, with the heavy rivet heads at all the seams and around the windows. It's old hat now, but I actually felt a bit creepy the first few times I got on a bus that didn't have a rear window.